Alex de Soto anchors the CFO Selections search practice. He brings over 30 years of experience in accounting, finance, human resources, and executive search to his role as leader of the search team. 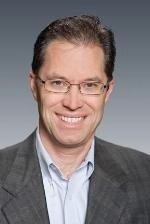 Since 2008, he has spent most of his time helping CEO’s and CFO’s of Pacific Northwest based companies find that unique match they seek for in a CFO or Controller. From 2012 to 2017, he served as a member of the Board of Directors of Compass Health, a large community behavioral health organization serving the five northwest counties of Washington. Alex’s deep hands-on experience as a former CFO, HR executive, and recruiter provides a unique combination of skills enabling successful placements at the highest levels. 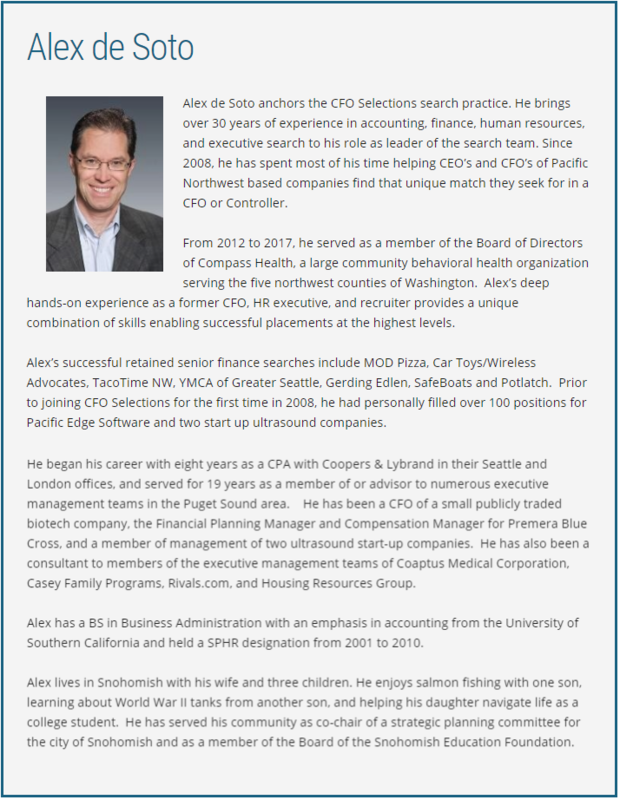 Alex’s successful retained senior finance searches include MOD Pizza, Car Toys/Wireless Advocates, TacoTime NW, YMCA of Greater Seattle, Gerding Edlen, SafeBoats and Potlatch. Prior to joining CFO Selections for the first time in 2008, he had personally filled over 100 positions for Pacific Edge Software and two start up ultrasound companies. He began his career with eight years as a CPA with Coopers & Lybrand in their Seattle and London offices, and served for 19 years as a member of or advisor to numerous executive management teams in the Puget Sound area. He has been a CFO of a small publicly traded biotech company, the Financial Planning Manager and Compensation Manager for Premera Blue Cross, and a member of management of two ultrasound start-up companies. He has also been a consultant to members of the executive management teams of Coaptus Medical Corporation, Casey Family Programs, Rivals.com, and Housing Resources Group. Alex has a BS in Business Administration with an emphasis in accounting from the University of Southern California and held a SPHR designation from 2001 to 2010. Alex lives in Snohomish with his wife and three children. He enjoys salmon fishing with one son, learning about World War II tanks from another son, and helping his daughter navigate life as a college student. He has served his community as co-chair of a strategic planning committee for the city of Snohomish and as a member of the Board of the Snohomish Education Foundation.